Throughout my daily life, I feel ripples in the universe. Yes this sounds strange. I'm not claiming that I'm psychic and I don't think I'm crazy (though the jury's still out). It has happened all through my life and it's time to write it down in an effort to gather opinions and experiences from others. At different times through our lives my brother and I have experienced the same dreams. There isn't an explanation that is feasible for me so far. We weren't in the same state, yet we had the same dream with an actual ocean between us. This is what I call a ripple. Somehow over all of that distance our shared experience connected us. My close friends and I have had strange things happen too. Surely some of you readers out there have had this happen as well. You pick up the phone to call your bestie and they're already on the other end of the line dialing your number. That dejavu feeling stands the hair on the back on your neck on end. These unexplainable moments are the ripples. The instinct that wakens a mother one minute before her child needs her is another example of a ripple. Sure routine could have something to do with it, but a maternal instinct is more than a product of a routine. We mothers can feel the pain of our children. At times the joy is so overloaded that you can't hold it in and it falls right out of you as tears. I picture an imaginary lake between the minds of the people I'm closest with and mine. An unintentional, yet poignant feeling can trigger a ripple in this lake. It somehow sends a signal to those that you need and love you the most. They are a buoy saving you or lifting you up in the middle of that lake. Ripples are the connections. There was a moment of shared experience I recall in Burlington, VT. My college girlfriends and I had travelled over Lake Champlain to check out a thrift store named Battery Street Jeans that had been raved about by someone on campus. Since we didn't know Burlington well, we pulled over to ask for directions, a very female thing to do. A beautiful, blue eyed man was happy to help. During his description of directions to our desired location, this man had all three of us mesmerized. He sent ripples through each of us with the way his words created a colorful, visual map of the gorgeous city of Burlington. Maybe he was just a special person who can appreciate the beauty of his town, but for all three of us to be rapt on high with admiration in the same exact way at exactly the same time was an ethereal reaction. A few nights back, I had a feeling of dread for no reason. Someone very dear to me called a few minutes later needing my ear. Had he sent me that feeling of dread as a ripple? There was nothing unpleasant happening in my world at that moment, so my guess is that it was a ripple. Hopefully my words helped him, but hopefully the shared moment of emotion did as well. I hope that by writing about the ripples, they don't mysteriously disappear like a mystical vapor. I hope that they increase and allow me to help others. I hope that my friends and family can feel the ripples that I intentionally and unintentionally send to them. I hope I am not crazy. I also hope that if even one person starts to pay better attention to the ripples and can channel them, the world can actually change. I hope that people take the opportunity to get connected. 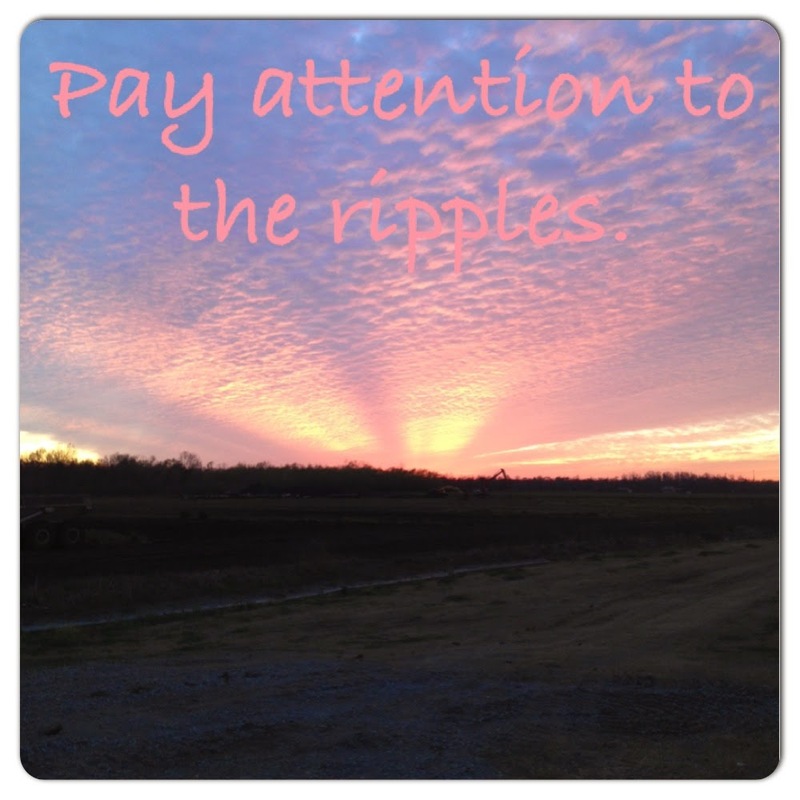 I hope you feel the ripples too.